Now available, just in time for the holiday season, three original works for the book lover in your life! 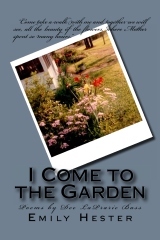 I Come to the Garden is now available at Amazon’s Createspace bookstore! This is a collection of poems by Lucy Dee Wright LaPrarie Bass and nostalgic photos of the Wright family and their Manifest, Louisiana home place. A Tree of Life is now available for as low as $9.99 on Blurb.com.This is an illustrated poem memorializing the gathering of kindred spirits. Help make a boy’s dream come true by buying a copy of his first published book Nathan’s Collected Works, also available on Blurb.com.